Self Cure Remedy details of Take black seed oil for the care and relief of High Blood Pressure, including effectiveness and popularity scores of the remedy. Black seed is believed to have a relaxant effect on smooth muscles and may act like a calcium channel blocker to dilate blood vessels. Another theory suggests that black seed extracts help the heart pump more efficiently, or have a diuretic action. Black seed also contains unsaturated omega-3 and monounsaturated fatty acids, flavonoid polyphenols and soluble fibre all of which can have beneficial effects on blood pressure control. Black seed might lower blood sugar levels in some people. Watch for signs of low blood sugar (hypoglycemia) and monitor your blood sugar carefully if you have diabetes and use black seed. Black seed might lower blood pressure. In theory, taking black seed might make blood pressure become too low in people with low blood pressure. 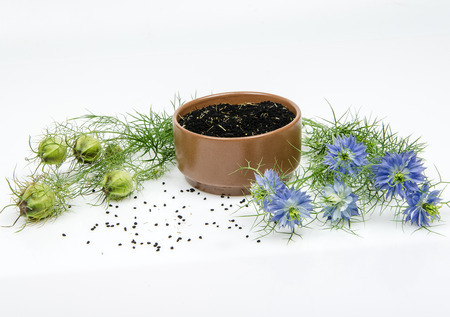 Black seed might slow blood clotting, reduce blood sugar, and increase sleepiness in some people. In theory, black seed might increase the risk for bleeding and interfere with blood sugar control and anesthesia during and after surgical procedures. Stop using black seed at least two weeks before a scheduled surgery. The self cure remedy of Take black seed oil for the care and relief of High Blood Pressure has an effectiveness score of 2.1 and a popularity score of 45 on the self-cure system.